Franny is a young woman on her PHD track who she receives a phone call that her aspiring musician brother, Henry, has been in a car accident. While trying to connect with him during his comatose state, she stumbles upon his journal. Following his insights, she discovers his local hangout spots, indie Brooklyn bands, and his all time favorite singer, James Forester. The two form a connection when she takes her brother’s ticket to his performance in the city. Franny uses her journalistic know how to record sounds from her Henry’s surroundings in hopes that it will spark life in him. She allows herself to experience the passion she’s been ignoring for the past six months after the final argument they had with each other. Anne Hathaway gives a quiet and insightful performance. Almost a coming of age for both Johnny Flynn and Hathaway. Flynn is charming as James. The two are a lovely on screen pair and their chemistry does not appear to be forced. Mary Steenburgen, plays Franny’s mother. She is a stunner in any role. The mother/daughter relationship in this film is the one that read most genuine. The moments of reckoning between these two characters are one that smack you in the gut in the most subtle ways.This should be notably attributed to writer/director Kate Barker-Froyland as the dialogue is honest and down to earth. These are conversations we’ve all had in our lives in some form or fashion. Also, cheers to her for penning an ending that is more realistic that most films in theaters these days. The big winners in this movie are the incredibly talented song writers Jonathan Rice and Jenny Lewis. Each track sung by James, as well as Henry’s first recorded song, are penned by the team. The songs are catchy and quirky lyrically. Think Butch Walker meets Coldplay. Take a listen to one of the tracks skillfully performed by Johnny Flynn. While portrayed as a romance, SONG ONE is much more. This little indie is a sweet film, perhaps nothing that will win awards, but not everything has to be so grand. SONG ONE is charming and as a New Yorker, I had a real appreciation to the love letter aspect to the city. The film is in theaters today. 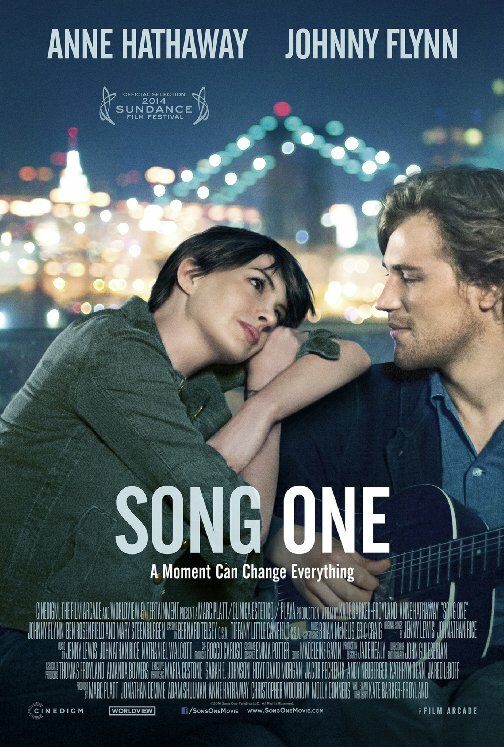 Oscar® winner Anne Hathaway (Interstellar, Les Miserables) stars as Franny in SONG ONE, a romantic drama set against the backdrop of Brooklyn’s vibrant indie music scene. After Franny’s musician brother Henry (Ben Rosenfield, Boardwalk Empire) is injured and hospitalized in a coma following a car accident, Franny returns home after a long estrangement and begins to use his notebook as a guide to how his life has evolved in her absence. Franny seeks out the musicians and artists Henry loved, in the course of her journey meeting James Forester (Johnny Flynn), his musical idol, whose success and fame belie a shy and private man. As a strong romantic connection develops between Franny and James, the question becomes if love can bloom even under the most adverse circumstances. The film, produced by Jonathan Demme, also stars Oscar® winner Mary Steenburgen (The Help) and features original music composed by Jenny Lewis and Johnathan Rice, and live performances from Sharon Van Etten, The Felice Brothers, Dan Deacon, Paul Whitty, Naomi Shelton and the Gospel Queens, Cass Dillon, Elizabeth Ziman and Lola Kirke. This entry was posted in Film Festival, Go To The Movies, in theaters, Liz, Poster, Release, Reviews, Trailer, What To Watch This Week, Woman Lead, Women in Film and tagged accident, Anne Hathaway, Ben Rosenfield, Cass Dillon, coma, Dan Deacon, drama, Elizabeth Ziman, family, Gospel Queens, Indie, January release, Jenny Lewis, Johnathan Rice, Johnny Flynn, Jonathan Demme, Kate Barker-Froyland, Lola Kirke. Paul Whitty, Mary Steenburgen, music, Naomi Shelton, NYC, romance, Sharon Van Etten, Song One, song writing, The Felice Brothers by Liz Whittemore. Bookmark the permalink.